Former Chelsea forward Jimmy Floyd Hasselbaink says Blues boss Jose Mourinho must sign a new striker in the January transfer window. Fernando Torres, Demba Ba and Samuel Eto'o have scored only five Premier League goals between them this season. And Hasselbaink, who scored 69 goals for the Blues, told BBC Sport that a new front man is a "key priority". "Jose Mourinho won't publicly say it but we all know he is looking for another striker," added the Dutchman. 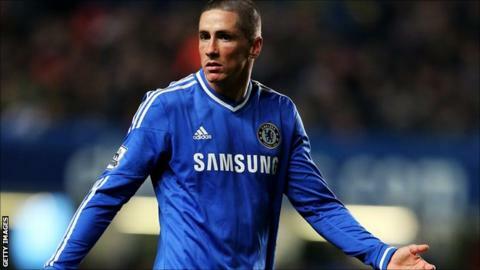 Fernando Torres: Six goals (two in the league). Demba Ba: Three goals (one in the league). Samuel Eto'o: Four goals (two in the league). "In the summer he was looking for a striker and could not find the right one. "He has always had a very dominant person at the front at every club he has been at who used to take a lot of pressure off the team." Hasselbaink, 41, was a £15m club-record signing for Chelsea in 2000 from Atletico Madrid and his assessment of the current crop of strikers - who have contributed just five of their side's 33 Premier League goals this season - is downbeat. "Yes they signed Samuel Eto'o [in the summer], but with all due respect to Eto'o he has been an absolutely magnificent footballer but he is not getting any better," added Eto'o, who appeared on BBC Sport's Football Focus on Saturday. "He is on his last [legs], he is getting older and he cannot play game in, game out. "Yes he can come off the bench, but he cannot lead the line. "Torres started the season well and we all thought he was getting it back but he is not very consistent and that has been his problem at Chelsea." In contrast title rivals Manchester City and Liverpool have been scoring freely - helped by the prolific form of Sergio Aguero and Luis Suarez. And it is this type of player Hasselbaink - who is now manager at Belgian side Royal Antwerp - believes Chelsea must sign. "They have been dominating games but they are not scoring a lot of goals and there is the problem," he said. "If you look at Manchester City they are scoring freely but they have a few good strikers. "If Chelsea had a Luis Suarez or Sergio Aguero they would be top of the league and a few points clear. "It is a problem in terms of who they can get, but they still need an out-and-out goalscorer, someone who is going to score you 25 goals a season. "They are playing more 4-3-3 with a lot of movement so you need an Aguero or Suarez or [Borussia Dortmund's Polish striker Robert] Lewandowski. "That type of player is not easy to find and there is not a lot of them about but at the end of the day if you have money to spend and if you are Chelsea then players will want to join you." Chelsea currently trail Manchester City and leaders Arsenal in the Premier League title race but Hasselbaink insisted: "It is not a two-horse race. "I think Arsenal have a part to play and Liverpool also. Manchester United are too far off and a lot has to happen for them to become champions. "Tottenham and Everton don't have the squad for a title race but can upset teams on their day."